Now there's a one-stop source of answers to the critical questions that arise in today's intellectual property claims. Handbook of Intellectual Property Claims and Remedies is the first single-volume treatise to focus exclusively on the substantive law governing remedies and strategies for obtaining them in intellectual property litigation. 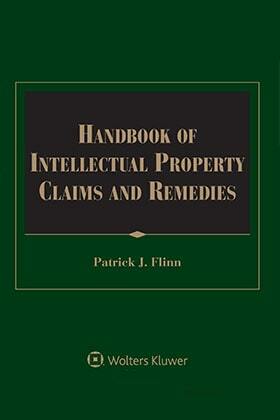 Written by Patrick J. Flinn, an intellectual property specialist from Alston & Bird in Atlanta, GA, Handbook of Intellectual Property Claims and Remedies offers step-by-step guidance on how to maximize -- or minimize -- possible remedies at all stages of litigation, from pre-filing decisions through appeals. Avoid costly mistakes at all stages of the case.Handbook of Intellectual Property Claims and Remedies is full of practice tools to help you build and present your best case, including a quick-reference matrix on IP rights and remedies, sample demand letters and responses, current statistics on jury awards, case citations, checklists, and more!